Competitive PC gamers may know the MOBA (multiplayer online battle arena) genre well, but games like DOTA 2 and League of Legends are almost completely foreign to console gamers. In recent years these titles have become incredibly popular in E-Sports, making for exciting (yes, really) tournaments with some obscene purses going to the winning teams. But one aspect of MOBAs that isn’t talked about often is the cooperative modes many of these games offer. Players versus Bots are a big part of training for MOBAs, learning the ins and outs, and a lot of times can be equally as rewarding as playing against human players. Monolith, a studio with roots in PC development, is bringing MOBAs to the console using the Lord of the Rings license with Guardians of Middle-Earth. So what exactly is a MOBA and how does it work? A basic match usually takes place on a map with three lanes. There’s a team base at either end of the lanes which contains some basic structures and a central crystal/tower/object which the team must defend. The lanes themselves all contain towers which must be destroyed by the opposing team in order to progress towards the other base. While players control hero units, the maps are also filled with soldiers and other fodder which spawn from each team’s respective base which help fight the good fight against the opposing team. In a way it has a tower defense feel to it, but it’s a bit more action oriented. You’ll still have opportunities to upgrade your defenses or upgrade your soldiers for offense, so strategy still applies as well. The team at Monolith has done an excellent job adapting the genre to a controller, putting all the commands you can possibly need one, at most, two clicks away. Players attack enemies using the right trigger or they can unleash special attacks mapped to the face buttons. Need to upgrade the special attacks when you level? Simply hold a modifier button and press the corresponding face button. You’ll never feel the need to go digging through menus mid game to figure out exactly what to do. The on screen interface clearly communicates what you need it to - with things like attack radius, direction, modifier effects all laid out. 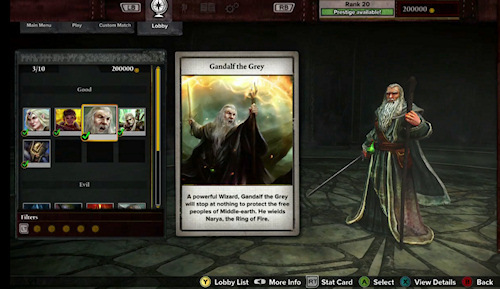 The centerpiece of any MOBA are the heroes themselves, called guardians in Guardians of Middle-Earth. These characters are pulled from Tolkien lore, including the movies, books and appendices - so expect to see both familiar and unfamiliar faces. There are around 20 guardians to choose from, split between the sides of "good" and "evil" and more are on the way in the form of DLC. While you’ll only have access to about one third of these from the start, more can be purchased by earning in game currency from completing battles and leveling up your player profile. This currency is used in other places as well to unlock gems and relics. These items are what’s used to truly customize your character and tip the scales of battle. With a belt that has seven slots, you can fill it with various relics that offer bonuses - and these relics are in turn filled with gems. For instance a relic may give you +1 HP regeneration or it may give you a bonus attack if you don’t attack for a few seconds. These relics only become active as you level up during a match, so there’s some strategy in how you place them prior to the match. Finally these loadouts are further customized with consumable items that are one time use bonuses for a match - these can be mapped to the d-pad.